iDNS Scam Letter. Don’t fall for this dubious marketing scam. 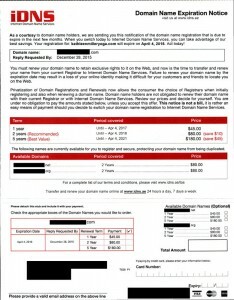 A few of our clients have received letters from fraudulent domain registrars. These letters, or “notices”, are often incredibly vague but have a friendly tone that often tricks domain owners into believing the notice is from their current domain registrar. We feel it is important to inform you that while this letter looks official, it is merely a phishing scam disguised as a domain renewal invoice. The companies who send these letters, such as iDNS, attempt to convince you into transferring and renewing your domain using their extremely overpriced services. Not only will they charge you, on average, 3x the market rate for domain name services, but they will also lock you in and make it extremely difficult to be able to switch back to a trusted registrar. While iDNS will legitimately renew and/or register a domain for you, their methods for gaining customers is very shady. 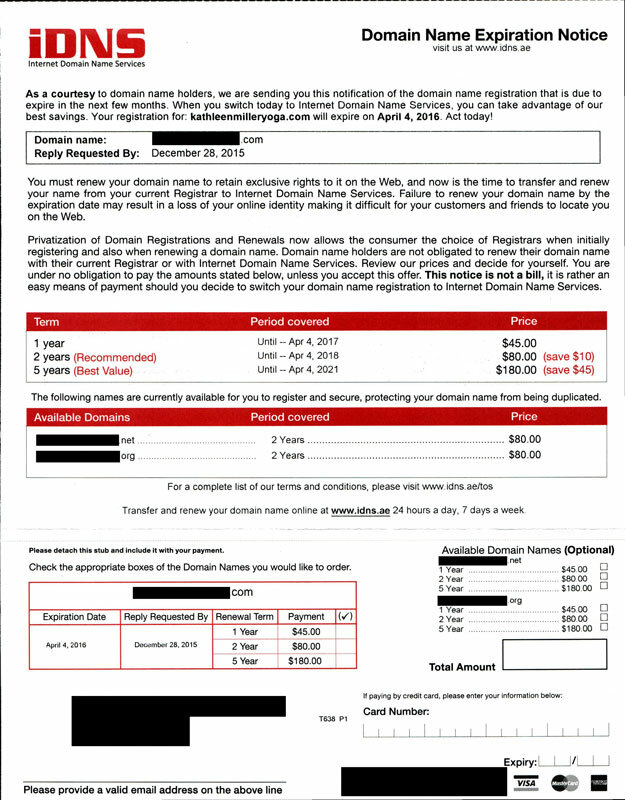 By sending these letters, they can often confuse an uninformed holder by reminding them that their domain is expiring and offering a fix to this “problem” before their current registrar has the chance to alert the domain holder of the impending expiration date. Once this domain holder falls victim to the iDNS domain registrar scam by transferring over their domain and giving iDNS their credit card information, iDNS will then lock the domain holder into paying exorbitant amounts of money for services that should be offered for much lower prices. If you receive a letter from iDNS or any other fraudulent domain registrar, IMMEDIATELY contact us. If your domain is registered with us, we are always aware of domain expiration dates and will contact you if necessary. We offer comprehensive and professional domain registration, as well as managed web services; we would be happy to provide you with the services you need, whether you simply need a domain registered/renewed or if you’re looking to build a new website with said domain. Whatever your needs are, In Touch is here to help. New changes are afoot. Looks like gmail is going to get more visual, at least if you messages are going to the Promotions tab. Marketer’s, time to rethink your email designs. What Gmail’s New Grid View Means for Your Emails | VR Marketing Blog. I got to know Carole during our training in the Anat Baniel Method, a holistic approach to human functioning and action, based in the understanding how the brain organizes all movement. 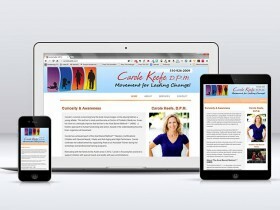 I was able to help her put together a custom responsive website for her Austin area practice focusing on supporting children with special needs and adults with pain and limitations. Carole has achieved each of the Anat Baniel Method(sm) Mastery Certifications: Children with Special Needs, Vitality and Anti-Aging and High Performers. Carole continues her advancement by supporting Anat as an Assistant Trainer during her workshops and professional training programs. If you’re lucky enough to live near Austin, I highly recommend working with Carole. I’m hoping that my easy fix will help some others who are Googling for answers. When I dropped my Win7 disk into my Sony optical drive and re-booted, I had no way of knowing that the BIOS set up a second drive labeled “UEFI Sony Optical”. All I knew was when I reached the disk choice option I couldn’t install Windows. During one of the re-boots, I realized that my boot order had changed. I saw “UEFI Sony Optical”, so I went into the CD-DVD Drive options and now saw “Sony Optical”, listed just under “UEFI Sony Optical”. All I did was change the drive in the #1 Boot Order field to “Sony Optical”, hit F10 to “Save and Reboot”. This time when I hit the “choose disk to install windows” screen, there were no error messages, and I could install Windows on any of my drives, just as I had done for years. I don’t know if everyone’s fix for the issue would be the same as mine. But it’s sure worth a try. Just make sure that you are not trying to run your Windows disk from any optical drive that says “UEFI”. I hope this helps some one out there! Thanks Hameister! You probably saved me days of work. I was able to change motherboards and went from AMD to Intel with just a windows repair and adding the new drivers. So cool! !